We are 1% of the way to reaching our goal. Send a message to your MHA. Tell them we have the right to know how our money is spent. There should be no secrets when public money is spent on public infrastructure and services. Send a message to your MHA. Tell them we have the right to know how our money is spent. We need to stop the drain on our finances and one of the first steps we can take is to legislate disclosure and reporting of how our money is spent in P3 deals. There should be no secrets when public money is spent on public infrastructure and services. For too long, P3 contracts have been a black hole for accountability and transparency, with generally negligible disclosure by the provincial government. Meanwhile, the use of P3 deals has accelerated while providing sweet deals to corporations and private investors. We need to stop the drain on our finances and one of the first steps we can take is to legislate disclosure and reporting of how our money is spent in P3 deals. Lack of access to information hides the true costs of public-private partnerships (P3) and privatization. There is a “black hole” for transparency and accountability in Newfoundland and Labrador. P3 deals create “debt bombs” that weigh heavily on future generations. 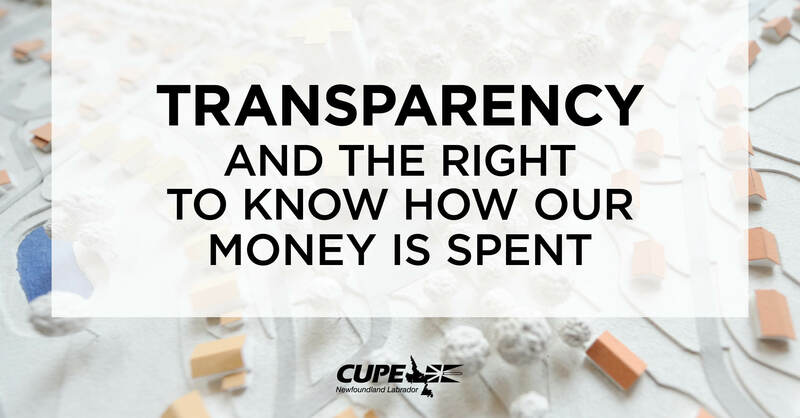 A more transparent and cost-effective approach to public procurement will ensure we can afford all the hospitals, highways, education, long term care and other public services we rely on. Newfoundlanders and Labradorians should demand new disclosure requirements and reporting standards for P3 contracts. There should be no secrets when public money is spent on public infrastructure and services.